Here's the bird's eye from the stand up paddle this weekend. 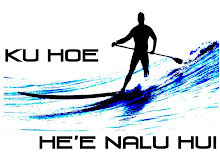 Don't forget to about the Ta-Hoe Nalu Paddle event this weekend. This morning we wrapped up the shooting for an international piece on the sport and lifestyle of Stand Up Paddle Surfing. It was an awesome opportunity to share with others around the world the passion and Aloha from some of us here in So Cal. I'd like to give a little mahalos to all that took their time to participate in way shape or form. Mahalos to Ron House, for taking some time from his master shaping of the new 12'6" race boards (for the Battle of the Paddle)...can't wait for those to be finished. And to EJ for his time showing off his beautiful hand made wooden paddles. Brad thanks for volunteering extra boards and equipment for the shoot that never happened.... I won't even go there. Pat from Rainbow Sandals for coming down and surfing with us. Can't forget the local morning lineup; Dennis, Jon, Michael, G-Money, Brandon and out star wahine Tracey. A special thanks for nothing goes out to the...... ah never mind, it all worked out. If it didn't happen they way it went down we probably never would of got the surf footage we captured this morning...and brah was it good. Right on Jon & Tracey. Fo' reals though, a special thanks to my new friends from on the other side of the pond for making this all possible, vielen dank! We look forward to seeing the final production in October! "Sweepers Sweepers man your brooms" was something I heard while in the Marines deployed on the Navy's vacation cruise ships. Funny thing. I've heard the "others" refer to us Stand Up Paddle Surfers as sweepers and had a good laugh with myself. I've read other non SUPS blog sites using the terms sweepers, janitors, oarers and some other descriptive and colorful names. All worth the chuckle I get but never rating more than that until now. I have to share this one, showing a sweeper. Down in Encinitas they made a "sweeper" statement a while back. I thought it was worth repeating. And "oarers"....is that all you got!? This morning we did a seven mile Stand Up Paddle. It was a really enjoyable experience. Not a blistering pace, had a couple pit stops, tried to surf an outer local reef without putting holes in the bottom of out boards, you know who you are. It was a blast. It didn't seem like 7 miles until you picked up the board. Good fun. And it was a pleasure meeting all the new faces. For all the Hawaiians out there, you know. Today was quite the adventure. Lots of challenges and fun. The surf started out decent, small inconsistent and overcast. Then the sun came out, surf picked up, cleaned up and had nice shape. I'd call it 2-3' but it was implied today that I have a broken measuring stick. And apparently a poor thermometer because the water is always warm to me. We're up to something over here at www.kingzofthecoast.com, not sure what but it is good. Stay tuned for the goodness. Awesome hand crafted custom exotic wood paddles. Summer seems to finally be here. The coastal eddy has lifted for us the past week almost. Days are warmer. We've had some pretty decent swells for the most part of the summer. Today seemed more summer-ish than lately. 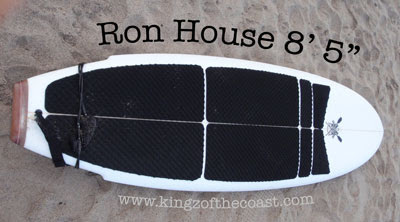 Ron House had a new little toy, see pic below. Looks like fun. So it's Tuesday and I'm still thinking about yesterday morning. Sunny- hasn't happened in a while, small fun little waves and small crowd. Fun fun stand up paddle surfing fun.